Far-left-wing French economist Thomas Piketty's book Capital in the Twenty-First Century has been making a splash in pundit-land. Establishment Leftists are holding the book aloft as vindication of their ideas; free-market libertarians are doing the facepalm. The book, of course, purports a rational case for massive forced wealth redistribution by the State as a solution to the ills of humanity. The results of such policies in Piketty's native France of late seem to have escaped his attention. Strong proponents of forced wealth redistribution generally possess two astrological markers on their charts. The first is a debilitated or compromised Pallas, suggesting openness to using force to impose one's will upon others. The second is the Venus-Neptune complex, indicating a Leftist view of material value. Neptune is, of course, the ruler of the political and economic Left. This is why the Left has most of humanity's creative artists (who are usually poor), generally lives in dense cities near large bodies of water, exalts the foreign over the domestic, ascribes transcendent spiritual characteristics to mundane government, and both obsesses over and perpetuates poverty. 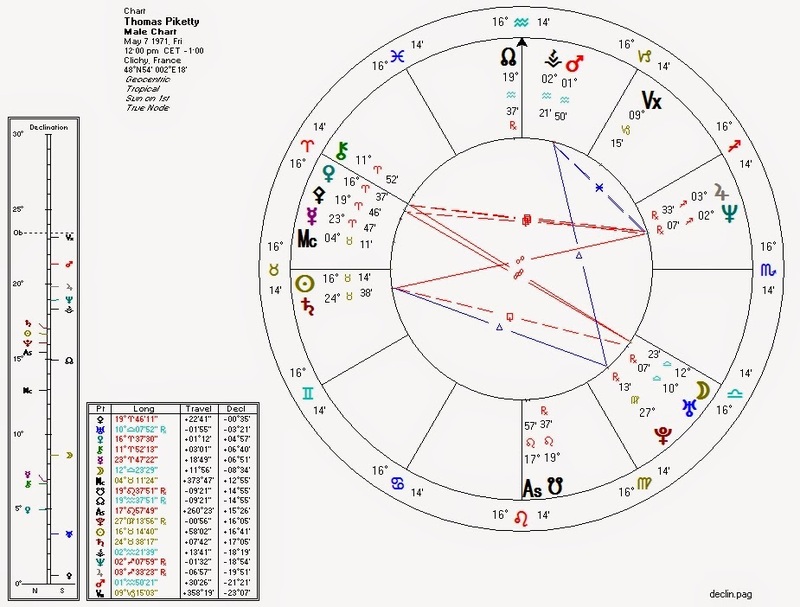 Bearing all this in mind, Piketty's astrological chart brings us no surprises. Libertarian: Pallas conjunct Mercury. A genuine ethical awareness. Authoritarian: Pallas sesquiquadrate Jupiter, trine South Node, and ruled by Mars which is trine Pluto. This is the full authoritarian trifecta, giving us a personality much more comfortable with force than with reason. So much for Pallas-Mercury. Leftist: Venus trine South Node, sesquiquadrate Neptune, and ruled by Mars which is sextile Neptune. There is clearly a tendency towards a Left-wing or "magical" perception of value. Ludwig von Mises argued that the general public needs to understand economics, so as to insure the survival of society. I might make a similar assertion about how our astrology informs our views on human rights and economic theory. The ideas that shape our society have planetary origins unknown to nearly all. astrolibertarianMay 22, 2014 at 2:51 PM http://www.lewrockwell.com/lrc-blog/hunter-lewis-examines-thomas-pikettys-improbable-data/ ReplyDelete astrolibertarianJune 3, 2014 at 5:48 PM Some very astute observations on Piketty by Peter Schiff: http://www.lewrockwell.com/2014/05/peter-schiff/envy-is-evil/ ReplyDelete astrolibertarianJanuary 19, 2015 at 6:52 PM https://www.youtube.com/watch?feature=player_embedded&v=yqIGnPw3Qkg In which Tom Woods and company reveal that Piketty willfully cherry-picks, distorts, and manufactures data to fit his conclusions. ReplyDelete Replies astrolibertarianJanuary 20, 2015 at 9:21 AM http://papers.ssrn.com/sol3/papers.cfm?abstract_id=2543012 This is the actual paper which proves that Piketty and his book are essentially fraudulent.